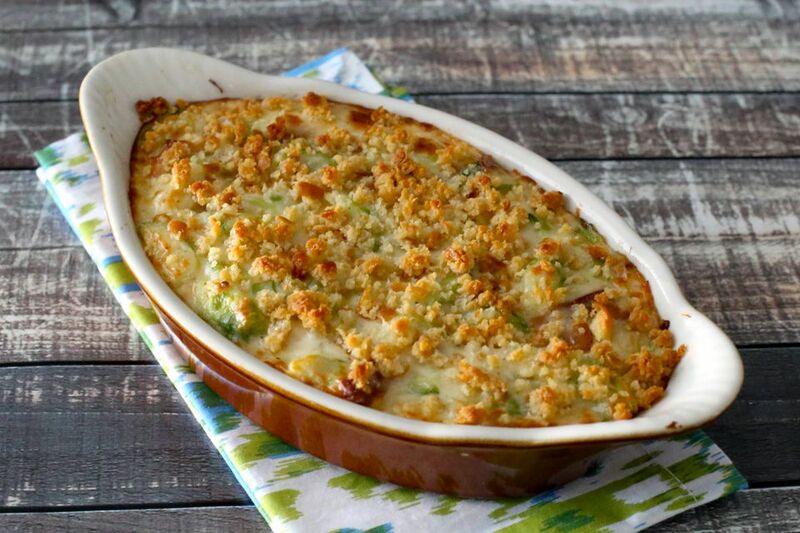 This Brussels sprouts gratin is an excellent choice for an everyday meal or holiday dinner. A rich fontina cheese sauce and buttery fresh bread crumbs bring out the naturally sweet flavor of the Brussels sprouts in this delicious side dish. Cheddar cheese is a good alternative to the fontina cheese, so don't hesitate to substitute if necessary. Crumbled bacon is called for, but feel free to skip that ingredient if you need a vegetarian-friendly casserole. Pancetta or 3 or 4 tablespoons of finely diced ham would also be nice additions if you'd like to add some smoky flavor. Cut off the core ends of the Brussels sprouts. Remove loose outer leaves and any damaged or discolored leaves. Quarter or halve the sprouts lengthwise. Rinse well under cold running water. Heat the oven to 400 F (200 C/Gas 6). Rub a 1 to 1 1/2-quart gratin dish or baking dish with the cut side of the garlic halves. Spray with nonstick cooking spray or lightly butter the dish. Bring a large saucepan of salted water to a boil. Add the Brussels sprouts and boil for 3 minutes. Drain and set aside. In a medium saucepan or saucier over medium-low heat, melt 2 tablespoons of the butter. Add the minced shallots and saute, stirring, until then are translucent. Add the flour, 1/2 teaspoon of salt, the pepper, and nutmeg to the saucepan and cook, stirring, for 2 minutes longer. Gradually stir in the milk or half-and-half. Continue cooking, stirring, until the sauce has thickened. Stir in the shredded cheese and bacon and cook, stirring until the cheese has melted. Gently fold the Brussels sprouts into the sauce. Melt the remaining 1 tablespoon of butter and toss with the bread crumbs. Sprinkle over the casserole. Bake the casserole for 20 to 25 minutes, or until the topping is nicely browned and the filling is bubbling. Are you the only one in the family who likes Brussels sprouts? Then freeze individual portions! Prepare the sprouts and sauce, spoon into individual gratin dishes or ramekins, top with bread crumbs, and bake as directed. Cool, wrap individually in foil, and store in the freezer. To reheat a gratin, bake uncovered at 350 F (180 C/Gas 4) until hot and bubbly, about 30 to 45 minutes, depending on the size. This cheddar Brussels sprouts gratin is another good choice, and preparation is even easier. It's made with cream instead of white sauce.